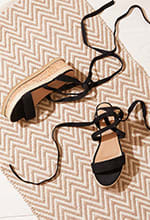 Walk a mile in our shoes with hot AF womens flats from In The Style. Get your hands on the latest trends to create a chilled look, suitable for any occasion. Keep your eyes peeled for this season’s most popular colours and fabrics. Choose from dusty pinks and subtle nudes, to loud prints and eye-catching metallics. Why not accessorise those ankles with a pair of fishnet ankle socks? Comfortable, yet stylish you are guaranteed to find yourself the ideal pair of womens flat shoes. Give your fave skirt a cool edge with a pair of lace up espadrilles or wear your flats with a shirt dress for a laid back vibe.